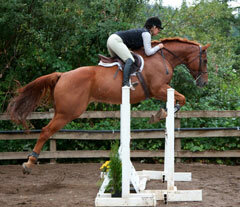 Wildtree Farm schooling shows are both fun and rewarding. Inviting jumps and courses, adequate warm-up, qualified judges, nice awards, fun competitors and a very relaxed family atmosphere combine for the perfect place to have a schooling show. And the prices are always reasonable. From poles and X's to 3' courses, the shows are a great place to start a green horse or rider or to "tune-up" a seasoned competitor. Shows are generally on Sundays, with schooling over the course and lessons from Norma available on the Saturday before each show. Wildtree Adult Camps are fun for adults of all ages and abilities who have their own horse and like to ride dressage, jump, or even just trail ride. There is something for everybody, from the serious competitor down to the older adult who is still interested in learning, but wants to take it slower. 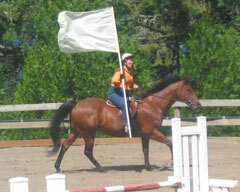 Two rides or lessons per day and all the food you could ever want is included in the camp. 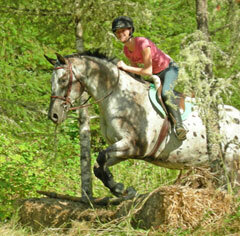 Camp is a way to get away from "real" life, be with your horse and friends 24/7, and just relax and enjoy. Quality instruction, both dressage and jumping, are offered at both adult camps along with some ground-work, trail course work or a very modified "extreme cowboy race". Campers who get tired, or just need a break, can sit and watch the others ride, relax with an adult beverage or sit in the hot tub. Wildtree Kid's Camp is a perfect summer activity for "horse crazy" kids. 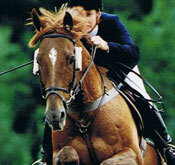 Activities include two rides per day which include quality instruction in flatwork, jumping and cross country, trail riding, games or even vaulting. It is geared towards kids 10 and up who own or have use of an appropriate horse and are secure at the walk, trot and canter. Other activities include swimming, watching horse related videos, stable management instruction, games, demonstrations, and camping in the barn loft. The warm atmosphere and sense of camaraderie provide the perfect setting for establishing great new friendships that last throughout the years. Most kids can't wait to come back year after year. And when they become adults, they move on to adult camp or become a counselor for kid's camp. 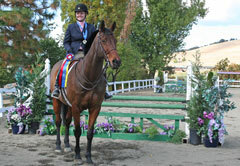 Wildtree Farm periodically sponsors quality clinics by professional horsemen. We have offered clinics in ground work, trail work, dressage and jumping and have even hosted the Yoncalla Rodeo Court tryouts. Check the calendar of events for dates. 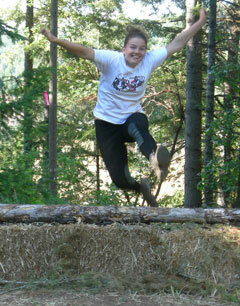 "I had a wonderful time at Jump Camp with Norma and all the other campers. Many of the campers had participated for years and all knew each other but were very friendly and supportive to a "newby". Norma's instruction was very helpful and all the different opportunities made the whole experience one I hope to repeat on a yearly basis." "I've been riding with Norma since I was 9 and I've really enjoyed every year. She teaches me and makes it fun at the same time. She explains things in a way that makes it easy to understand. Her kids camps are the highlight of my summer. We all have an incredible time while improving our riding skills and learning how to better care for our horses. I think the horses have a great time too!"